BB-8 is a Star Wars: Episode VII The Force Awakens minifigure released in 2015. 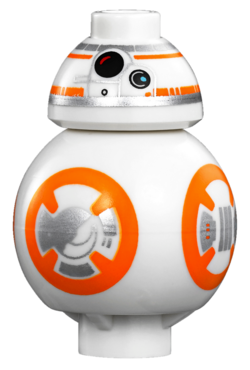 BB-8 was a droid who belonged to Poe Dameron. While under attack from the First Order on Jakku, Poe stored a piece of a galactic map that detailed Luke Skywalker's location in BB-8. BB-8 wandered Jakku and eventually found a scavenger named Rey. Later, Rey ran into a rogue stormtrooper who said that the First Order was looking for the droid. After returning to the Resistance Base on D'Qar, BB-8 acted as the droid co-pilot to Poe Dameron in the Battle of Starkiller Base. BB-8 later discovered that R2-D2 had reactivated after spending the years since Luke's disappearance in low-power mode. When R2-D2 revealed that he had the other piece of the map, the two droids put their pieces together and revealed Luke's location. Rey and Chewbacca then set off to find Skywalker. BB-8's reveal image from a LEGO catalogue. BB-8 in LEGO Star Wars: The Force Awakens. BB-8 wearing a Santa hat in 75184 Star Wars Advent Calendar.